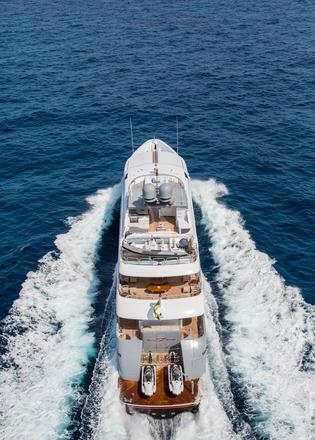 The 161-foot (49.07m) luxury Trinity superyacht ZOOM ZOOM ZOOM is reputed as one of the fastest yachts in her size range on the open seas. 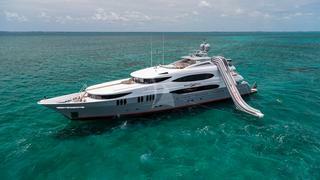 Not only is she quick, ZOOM ZOOM ZOOM also boasts impeccable style and grace. 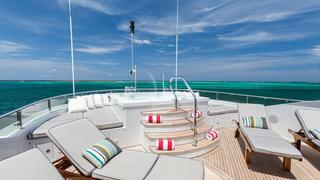 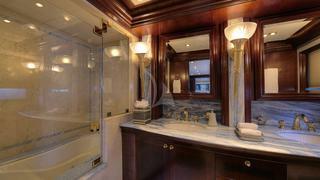 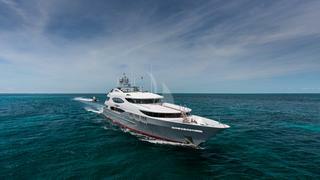 Guests will enjoy ultimate luxury while cruising The Bahamas and Caribbean on board this resplendent yacht. 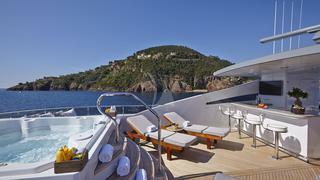 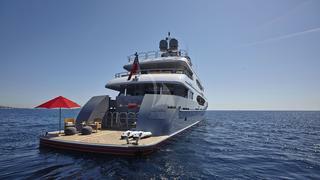 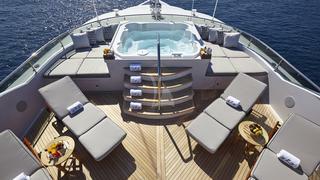 ZOOM ZOOM ZOOM already possesses a successful charter history and is the perfect yacht for your next luxury holiday. 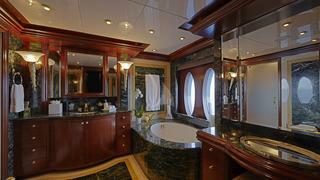 Guests who enjoy the water will be delighted by ZOOM ZOOM ZOOM’s extensive toy inventory. 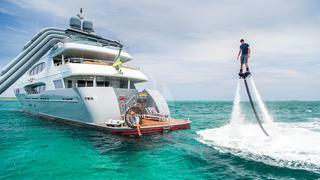 She features a towable tender, an 18-foot Nautica with 150hp engine, two three-person WaveRunners, two Seabobs, snorkeling gear, water skis, a wakeboard, a kneeboard, inflatables and fishing gear. 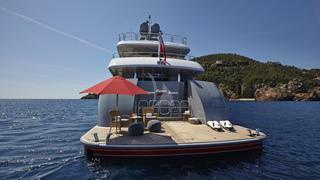 Fitness buffs will enjoy the onboard spinning bike and free weights with bench. 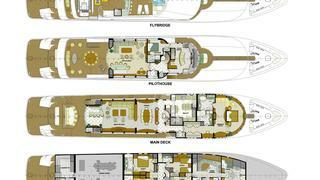 ZOOM ZOOM ZOOM is an extremely tech savvy yacht. 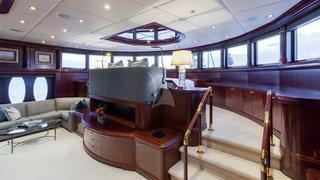 She features satellite TV in the skylounge, surround sound throughout the yacht, iPod docks and an expansive video and movie library. 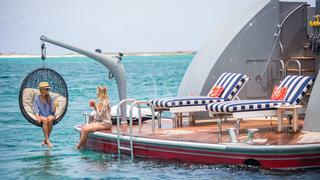 It also is equipped with 4G Wi-Fi in coastal areas. 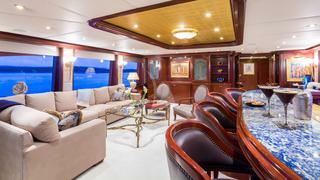 ZOOM ZOOM ZOOM’s interior was designed by the renowned Evan K Marshall, who has created a sophisticated atmosphere on board. 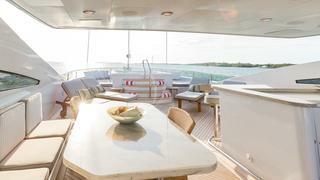 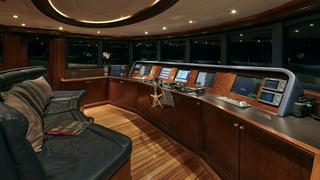 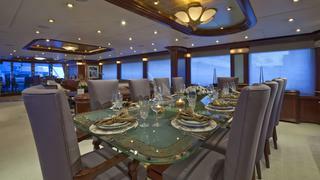 The yacht offers a variety of spaces for dining and entertaining. 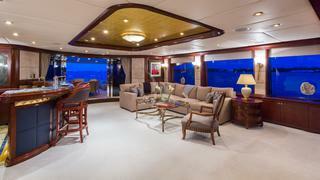 Her full-beam skylounge is a favorite guest space. 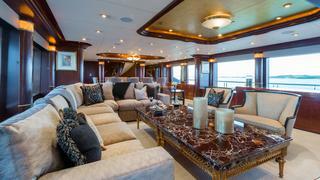 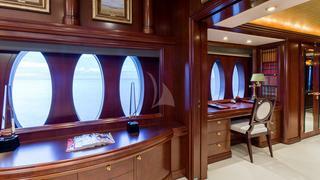 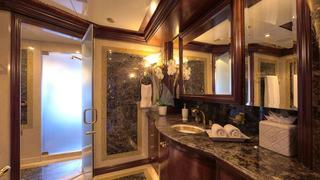 ZOOM ZOOM ZOOM carries 10 guests in five beautiful staterooms. 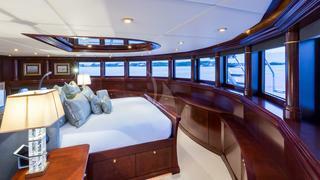 Her on-deck, split-level master suite features a private study, king-size bed and his-and-hers en-suite bathroom with a steam shower and Jacuzzi. 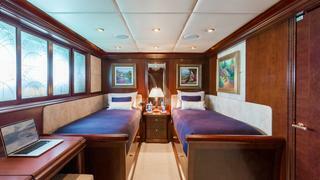 All additional cabins, including two VIPs with king-size beds, a queen cabin and a twin cabin, all are located below deck and have en-suite bathrooms. 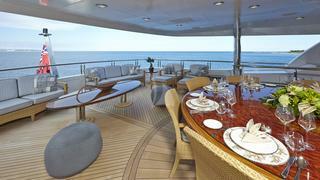 The alfresco spaces of ZOOM ZOOM ZOOM are equally as impressive. 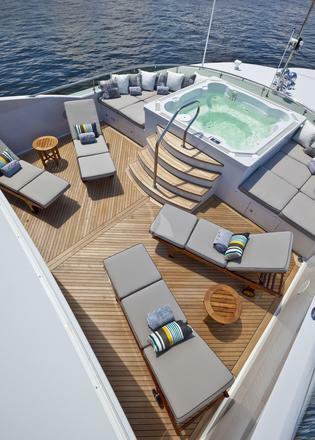 The extended stern swim platform can be utilized as a beach club, waterside alfresco dining space or the perfect spot to launch water toys. 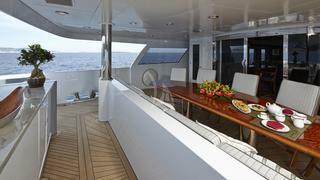 The main deck aft has a cozy, covered dining space with bench seating and five chairs; the bridge deck aft features comfortable outdoor furniture for lounging and a covered large round table for alfresco dining. 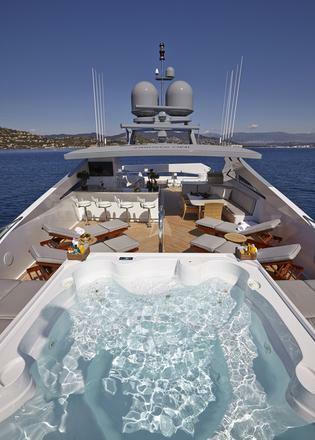 The sundeck offers a bar, Jacuzzi and sunpads; it is an ideal space for entertaining under the stars.